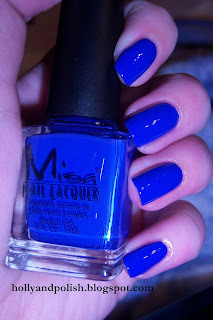 Today the color I’m wearing is Throw Me Something Purple Please by Misa. This color isn’t really purple, so I’m not sure why it’s named this, but whatever. Throw Me Something Purple Please is a blue shade with a very slight hint of purple to it. The 6 year old that I nanny said that she thinks that this polish should be described as indigo instead of purple. (She’s probably right) This color is super pretty, but was really hard to photograph. I feel like my swatches look a bit more blue than what it really looks like in person. The formula for this polish was very thick and went on very smooth. For some reason though, after I got home from work this polish started to just peel off. I wore a top coat and have never had that happen with any other polish before, so I don’t know why it did that.